The Hayes Homestead: What's Up Wednesday! Hey everyone! I'm a 'What's Up Wednesday' newbie and so happy to be here! I stumbled upon this linky party earlier this month and couldn't wait until today so I could join! We've been in our house for just over a year now. Crazy to think that this time last year our house was still full of boxes and we had no furniture in the living room. We've done a lot to our house in the past year, but still have a lot more planned! It's bright and funky and I LOVE it!! Everything! I can't believe how busy we are this summer. I would really like 5 more hours in the day (at least) and an extra 40 minutes in each hour. Is that too much to ask? The summer ending! Now that it finally feels like summer here in MI, it's going to be gone so soon. Just six more weeks until Redmond is back in school. Time is flying! Getting my house ready for company! Our guest room is a disaster - it's currently our catch-all and mine and Jason's closet. Time to get that sucker cleaned up. My brother and sister-in-law are going to be here for a few days next week. I'm so excited!! Family. Not only are my brother and his wife coming to visit, but so is my sister and my nieces and nephew. My sister will be staying for a week in a lake cottage so we get to spend a lot of time with them and in the water. Can't wait!! Reading - researching Kombucha, essential oils, and new dishes for the kids. Their plastic dishes are the next to go in my quest to have a (mostly) plastic-free home. I've always hated shorts. But, all the Spinning and running I've been doing has paid off and I don't hate them quite as much. Plus, it's been so hot here lately that capris just aren't cutting it! Our chickens should be laying soon! Can't wait to find our first fresh egg!! Now that Redmond doesn't nap everyday, him and I have been spending time while Ashlyn is sleeping working on school related things. 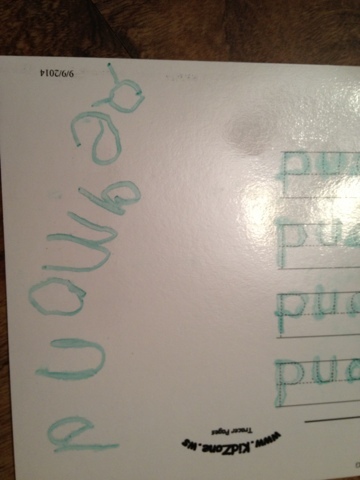 Practicing writing, drawing, sight words, etc. 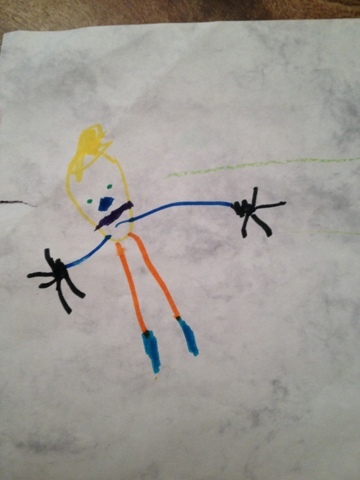 He is getting so good at writing and drawing! So proud of our little man!! Can you believe summer is almost over!? Thanks! It really helps with time management (as well as the wallet!) when I menu plan. I used to be so good at it, need to get back to it!! It is a great show, but you have to pay close attention.....which I'm not good at. I'm constantly pausing it to ask my hubby what the heck is going on :) I'm in love with the orange room. Definitely not for everyone, but I love pops of color!! Oh my gosh! I have so much to say to all of this! 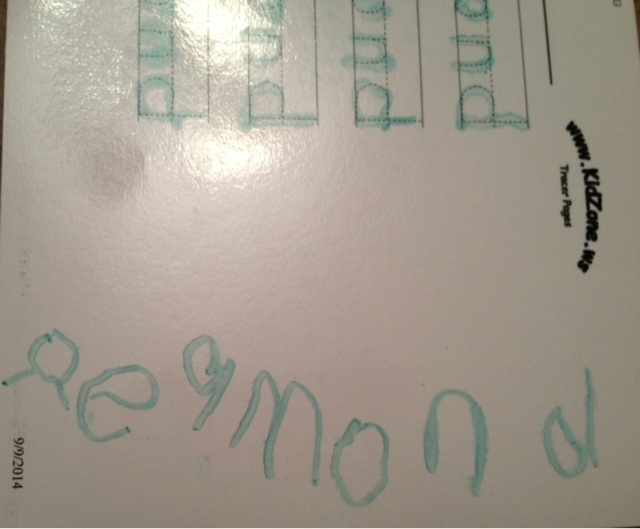 Wowzer for Redmond writing his name! That's amazing! 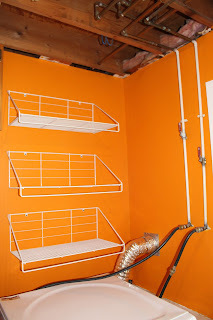 Oh and that color in your laundry room... Loooooooove it!!!! Hey Sara! So exciting to still be settling in and making your house a home. That mango paint is going to make doing laundry much more fun. :) I tried Kombucha for the first time recently. It's really popular out here in Hawaii. The Monthly Meet Up - Fourth of July! !